Hunting and fishing licenses for Georgia residents are changing Saturday, July 1. 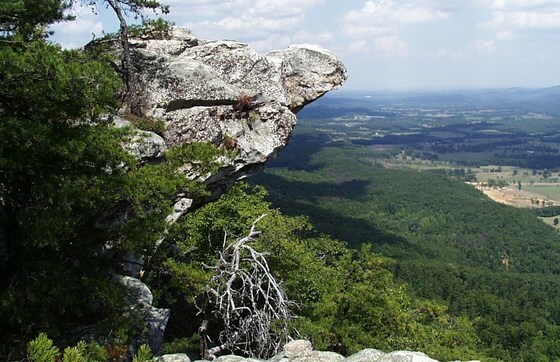 One key change is that the Wildlife Management Area license and the Georgia Outdoor Recreational Pass, or GORP, will go the way of dinosaurs. Instead, starting Saturday, hunting and fishing licenses will provide access to WMAs and Public Fishing Areas. A new Georgia Lands Pass will, too, at $30 a year for residents 16 and older and $60 for nonresidents. An annual resident hunting or fishing license will cost only $15 a year. And each license bought makes the state eligible to receive more federal taxes paid by industries on sales of guns, bows, ammo, fishing tackle, some boat engines and small engine fuel. A “certified” hunting license has returned to Georgia as much as $50 and a fishing license $10 in federal Wildlife and Sport Fish Restoration funds. The money is used for wildlife management and conservation, such as improving habitats. Georgia was eligible for nearly $30 million in Wildlife and Sport Fish Restoration funds in fiscal 2017. Do the numbers. A $30 Lands Pass offers 12 months’ worth of public lands access. For half the cost – $15 – a resident license holder enjoys a year of access plus hunting or fishing privileges, while returning to Georgia as much as $65 (for a hunting license) or $25 (fishing), including federal funds and the license sale. The bottom line: A fishing or hunting license provides inexpensive access to state lands and it substantially improves the state’s ability to manage those lands for wildlife. Learn more at www.georgiawildlife.com. Editor's note: Access to some DNR Wildlife Resources Division sites, such as WMAs on national forests, will not require a license or Lands Pass. Sites that do will be listed at www.georgiawildlife.com. By now, saltmarsh sparrows have left Georgia’s coast and the southern rivers of grass where they winter for marshes from Virginia to Maine where they nest. Yet although gone, they are not forgotten: They are followed. A tracking project started this spring by Georgia DNR and the U.S. 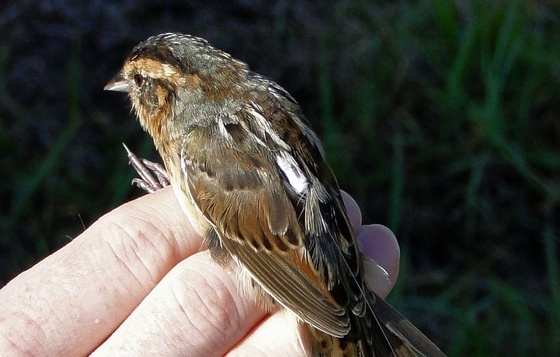 Fish and Wildlife Service is focused on pinpointing where saltmarsh sparrows from Georgia breed. Such connections, including the sparrows’ migration stopover sites, are considered vital to conserving a species that otherwise could go extinct in 50 years. Making it all possible are mini-transmitters light enough for birds that weigh only about a half-ounce. Use of these “nano-tags” and the addition in Georgia of towers used to track them mark the state's entry into the hemispheric Motus Wildlife Tracking System (motus is Latin for "movement"). See project photos. Also watch a crew drag for sparrows. Saltmarsh sparrows nest in marsh grass near the high-tide mark, timing their egg-laying to hopefully allow young to fledge before peak tides flood a nest. And while extreme tides destroy many nests, females will return to incubate eggs in flooded nests after tides recede (video). 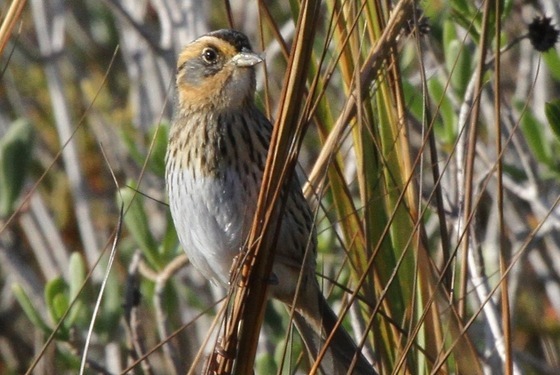 Saltmarsh sparrows are a high-priority species in Georgia's State Wildlife Action Plan, a comprehensive strategy for conserving native wildlife and plant species statewide before their populations become more rare and more costly to restore. You can imagine the reaction when I tell people I work with skunks. The most common is distaste, maybe even disgust. But I’m hoping that more information about these misunderstood animals will help change that response. 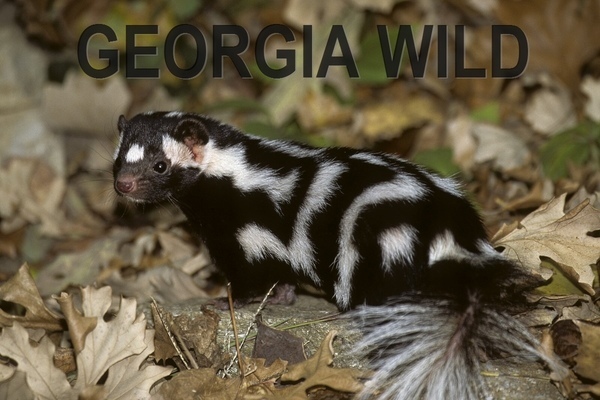 For example, did you know that Georgia is home to two species? One, the eastern spotted skunk, is unknown to most people. Chances are you’ve never seen one (if not, here's a video). 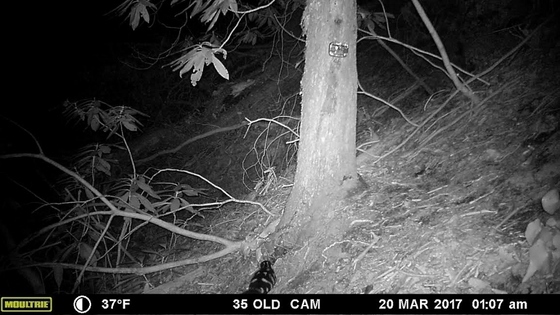 Read Emily’s blog post about her search for spotted skunks. When threatened, spotted skunks often display a unique defensive behavior: They do a handstand to spray their scent directly over their head. Emily Ferrall is a wildlife technician working with skunks and other mammals for DNR’s Nongame Conservation Section. DNR scientists sampling mussels in the Etowah River Basin upstream of Lake Allatoona recently documented three live Alabama rainbows, one Coosa creekshell and two finelined pocketbooks. Finelineds are federally listed as threatened; the other two species are petitioned for listing under Endangered Species Act. The discovery marks only the second known population of these species in the Etowah system, and the only known native mussel populations upstream of Allatoona. 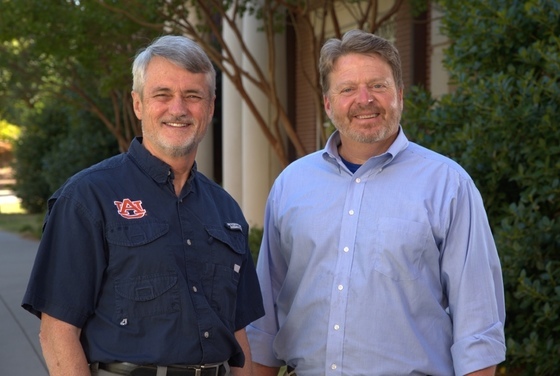 From banking to protest to botany, the path that Dr. J. Mincy Moffett Jr. of DNR’s Nongame Conservation Section took to his current work with rare plants and the Georgia Plant Conservation Alliance is explored in this Auburn University profile. Although he has scaled tall buildings to hang massive banners, Moffett calls the Association of Fish & Wildlife Agencies honoring the alliance last year with a special recognition award “the biggest thing that has happened to me professionally” (“Plant network outstanding,” Sept. 28). The article will be published in Journey, the Auburn College of Science and Mathematics magazine. Streamlined and redesigned for all devices, the DNR Wildlife Resources Division website www.georgiawildlife.com debuts this week. The new look and structure will make it easier to find needed information. Comments welcomed. In addition to camps varying from Wildlife Rangers to Fellowship of Christian Athletes Shooting Sports, Charlie Elliott Wildlife Center also plays a role in professional development. The center recently provided support for two teacher workshops, one with Henry County educators on life-science standards and another – River to Reef – on Altamaha River ecosystems and water quality issues. Names in the news: U.S. Fish and Wildlife Service Southeast Region Director Cindy Dohner is being reassigned to assistant director for international affairs for the agency, part of Interior Department changes reported recently. In an email to regional staff, Dohner praised their work, including in response to disasters such as Hurricane Katrina and the Deepwater Horizon oil spill: “What you have achieved during these catastrophes for both people and the environment exemplified public service at its finest.” Mincy Moffett isn’t the only member of his family in the news or into conservation. Daughter Harper Ann, an Oconee County High School junior, made headlines for helping students at Colham Ferry Elementary School in Watkinsville take part in a State Botanical Garden of Georgia conservation program called Connect to Protect. Harper Ann is coordinating the Oconee High Environmental Club’s involvement in Connect to Protect, which teaches about native plants by encouraging locals to support pollinators by planting native species. Aug. 21 – Ladies Day at the Range, 10 a.m.-3 p.m., Wilson Shoals Wildlife Management Area Shooting Range, Gainesville. Limited to 10 participants. “Biologists, veterinarians tracking manatees tagged off Cumberland Island,” The Florida Times-Union. Also: WABE-FM (90.1, Atlanta), Saporta Report. "Dance of the dunlins," shorebird flocking behavior spurred by peregrine falcon attack, Ray H. Related Birdnote podcast "Dunlins and peregrines." Some nonvenomous snake species in Georgia are often misidentified as copperheads, the state’s most common venomous species. The two top images in this collage are copperheads. 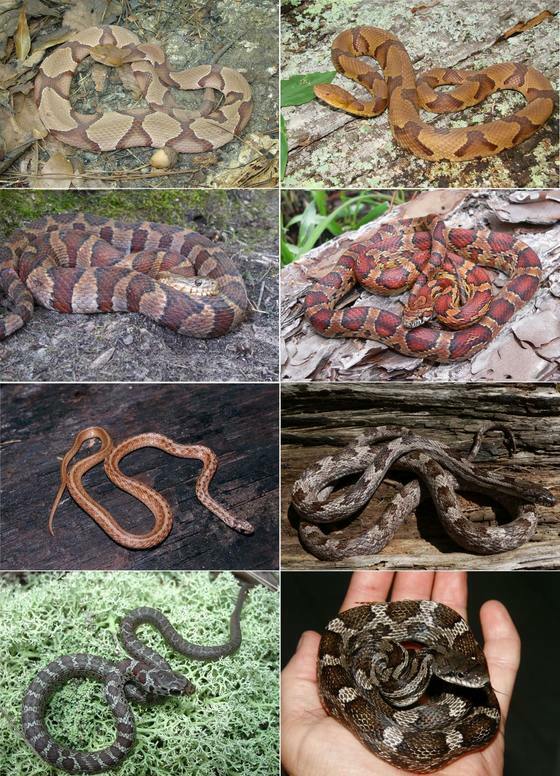 Nonvenomous snakes sometimes confused for copperheads include (left to right, second row) northern watersnakes and corn snakes; (third row) brown snakes and gray rat snakes; and, (bottom row) juvenile black racers and juvenile black rat snakes. Credits: copperhead (top left), northern watersnake and black racer, Dirk J. Stevenson; juvenile black rat snake, Greg C. Greer; other photos: John Jensen/DNR. Learn more about Georgia's snakes.